I grew up in the next town over from the nursery - in Marbletown, more specifically, the hamlet of Lomontville. Before starting Catskill Native Nursery, I was an insect ecologist in academia. I have degrees from Williams College (Biology BA), the University of Iowa (Zoology MS) and the University of California at Davis (Zoology PhD). I did research post-doctorals at the Australian National University, Research School of Biological Sciences in Canberra (5 years); the University of Hawaii, Department of Entomology (2 years); and the University of South Carolina, Department of Biological Sciences (2 years). Most of my research involved insects that feed on plants so I was always growing plants to feed my insects. Other than that I've had no formal horticultural training or experience. As an ecologist though I 've had a long interest in the flora of whatever place I happened to be living in at the time. As a child, nature was a hobby - I was mostly interested in birds and woody plants. So, I grew up learning Catskill Mountain plants. I know the California flora pretty well, Australian flora not as well as I'd like, Hawaiian flora a little bit (most of it is overrun with invasive exotics) and some southern Appalachian flora. We started building the nursery in 1997, opened for business in 1999. Green Witch Herbs & Garden Design was founded by my partner, Diane, in 2001, as a natural progression of growth in our nursery business. 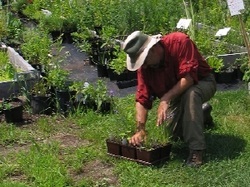 This allowed us to enhance our stock of native plants with a variety of garden favorites, including herbs, and take advantage of Diane’s ability and training to create very special gardens. Diane’s background includes studies in fine art, drawing, painting and architecture while living in New York City. 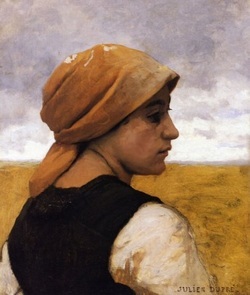 She earned a BA in Art History from NYU, and has studied at Art Students’ League. Her practical experience in gardening began as an apprentice at Peconic River Herb Farm on Long Island. She has studied horticulture at The Brooklyn Botanical Garden, and herbalism in the Catskills. Diane has had a long-time passion for plants, even when it could only be satisfied by tending a roof garden in Brooklyn (it takes dedication to carry 50 lb. bags of compost up three flights of stairs). She considers her official title to be Professional Peasant. You may visit her (sometimes weedy) display gardens at the nursery and marvel at her vegetable garden that has learned to take care of itself, since Diane is mostly off designing other people’s gardens. Galdur (on the left) and Brynja are our Icelandic sheepdogs. "Icies" are a rare breed created by Scandinavians 500 years ago to protect fish being dried on lines by barking away predator birds and to herd sheep and (we suspect) children. They enjoy making noise, mooching treats and sometimes doing a little valet parking. 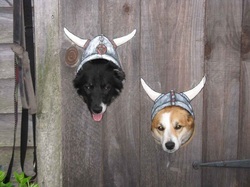 In this photo they are expressing their Viking heritage while looking out from our potting shed door, which is where they go when they need a time out from the excitement of helping to run a plant nursery. Despite problems being few and far between, we respectfully ask that you leave your "fur kids" at home where they are safe, cool and have their own territory to roam.